Recently I decided to look for my 2nd great-uncle, Andrew Stark (1829-1883), who emigrated from Ireland to Stamford, Fairfield County, Connecticut, in the mid-19th century. 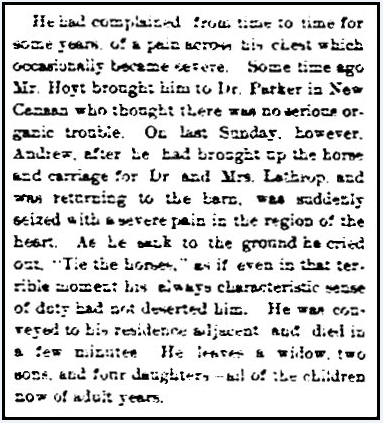 I know from my FamilySearch notes that Andrew died 2 September 1883, so when I found this September 7th obituary in the Stamford Advocate, I knew I was on the right track. “There is something after all, in character. Something, that in the long run, proves itself the most potent element of personal distinction. It levels, not down, but up. More than wealth, or genius, or exceptional skill, or knowledge, or high birth, it compels respect and recognition, and chiefly from those whose good opinion and regard are worth the most, because they themselves have character. Wow – what a beautiful tribute. The writer of this obituary thought highly of Andrew. Further down in the article, we learn a bit more about what happened to Andrew, who died at age 54. It sounds like he had ongoing heart disease, perhaps unstable angina – and died of a heart attack. I knew very little about my great-uncle, and without GenealogyBank, I never would have found what happened when he died and this testimonial of his life and character. Andrew must have been an exceptionally good and honest man. 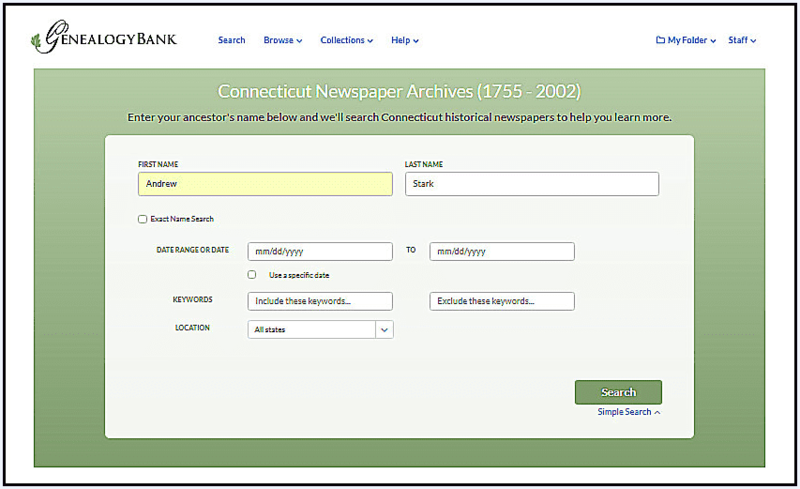 Genealogy Tip: Obituaries are the best source to learn more about who your ancestors were. Find each one and document their lives. I can think of no higher praise than to have somebody write like this about you. He obviously was a good man and his friend cared very deeply for him. I was really glad to find this obituary. 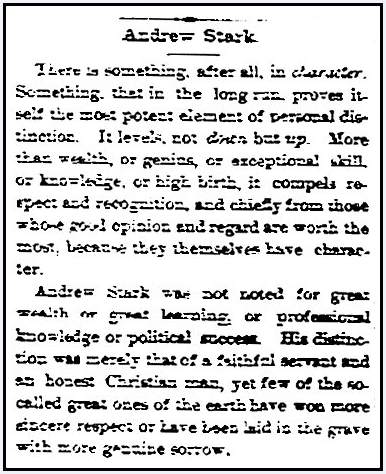 Before this ‘Andrew Stark’ was simply one more name on my family tree – not much more than his life dates and family details. With this commentary – I was able to learn more of the circumstances of his death – and to see the high regard others had for him – that he was thought of as a ‘good guy’, hard working right to the end. Thank you for writing Linda.